Choosing the right location for your retaining wall is very important and can save you lots of time and money. The explanation to go with this diagram appears at the bottom of this article. 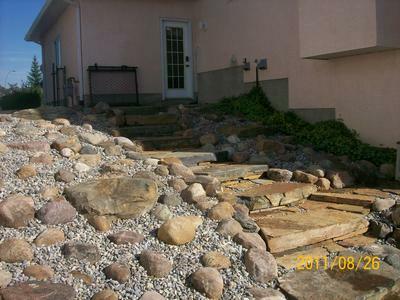 This slope of natural slab steps and a small boulder rock garden is a great way to have a low maintenance slope. When we put together an article on “Landscaping a Slope” last year, we were surprised at how much traffic it received. The article has a strong focus on factors that must be considered before you start planning and we had some great feedback. One of the biggest mistakes made by do-it-yourselfers, is biting off more than they can chew. We wanted to make sure this doesn't happen by explaining some of the challenges people face with hillside landscaping. So here are a few more tips for landscaping a slope, and some food for thought to go along with them. Take pictures of the area from all angles in every season. I know very few people do this, but a well thought out and successful design is difficult to achieve without good pictures. Also try to have one good shot that shows the “true” degree of the slope. This is easier said than done, but this one will can come in handy when shopping for materials. Most planning and design work is usually done at the kitchen table, so having these pictures will help you a lot. They can help you avoid overlooking important issues that can cause you grief down the road. Knowing how the sun and shade will impact the area will also help in choosing the right plants. If you are dealing with a garden center or tree nursery, the pictures you bring will help experienced staff make the right recommendations. Plants and trees for landscaping a steep slope are chosen carefully for their extensive root systems, moisture, and soil requirements. For some reason, people tend to design a landscape with what they want, and make proper drainage an afterthought. Regrading or fixing drainage problems is probably the number one repair in landscaping. With landscaping a slope, water damage is obviously going to be even more of an issue. Before designing your slope, it doesn't hurt to take pictures during a heavy rain. This is a big help if you have to include drainage above or below the surface. Don't fight with water, work with it whenever you can. In order to do this, you will have to know the natural course it takes. I usually only modify the path of water if the natural one just happens to be a little too straight or boring. It may be an option to split, or spread the flow of water if you are dealing with a single solid stream. You can also build a dry creek be that will be able to handle the erosion water can cause. The water may not appear to be a powerful force, but it is persistent. Look at what it did to the Grand Canyon over time. Dealing with drainage could be the first part of your design, with everything else being planned around it. You don't have to do it this way, but this ensures drainage will not be overlooked. Controlling water can mean the success or failure of your project on a slope. The better you are at controlling water on the surface, the less problems you are prone to have with it below the surface. Don't forget that you will also have to control the water when it leaves the bottom of the slope too. It helps to know what the composition of the slope is. Is it well packed and settled? Newly graded and possibly unsettled? Sandy? Clay? Rocky? My choices of how to landscape a slope can often be determined by this very factor. If your budget is limited, design the slope in the most practical way that mother nature intended. This also tends to be the most cost effective way. Fighting the site, or having to change existing conditions of soil can be very costly. Be resourceful whenever you can. I installed the stone slab steps (Picture above) for a customer, while they found all the boulders. After negotiating a very small fee with a farmer, they were allowed to pick them up from the field in their pickup truck. Although this may seem like the cheapest or easiest option up front, it may cost you more in the long run. Adding a couple of inches of good soil over a hard packed clay base is a risky thing to do on a steep slope. The roots will have a very hard time penetrating into the clay soil whether you stake the sod or not. This creates a problem with sodding a steep slope that we refer to as a “slide plane”. Water will permeate through the lawn and topsoil, but can can sit on the clay base. Enough water built up will create a slippery film that could become a mini slide plane for your sod. I am sure most of you have seen this phenomenon, but were not aware of how it was created? Mowing steep slopes is not practical, and grass struggles in the summer months, as slopes tend to dry out very quickly. Rock gardens, steps, and retaining walls are a great way to deal with slopes, but you should be aware of the forces of nature. Some people will actually choose slab steps and natural stone walls over manufactured or mortared products. Shifting, settling of soil, frost heave, and hydrostatic pressure can easily crack mortar and shift the nice horizontal lines of a manufactured brick wall. Natural stone may cost a little more, but is much more forgiving in appearance if things do settle. These issues can certainly be overcome with first class prep work, but if you are doing this work yourself, do not cut corners. Even experienced and professional landscapers can run into problems here. We talk more about this in our other article but I want to leave you with one planning and design tip that you won't find there. We don't always get to choose where we can put a retaining wall, but strategically placing a retaining wall can save you a lot of work, or money. Place your wall where where you will have the least amount of digging, back filling, moving or disposing of excess soil. There is a very basic sketch above to show you what I mean. 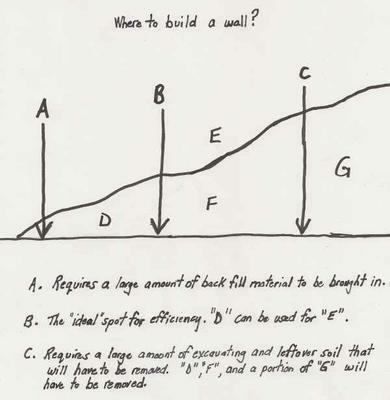 If the wall is built too far away the bank, you may have to bring in back fill material. If the wall cuts too far into the bank, you will end up with an excess amount of soil to dispose of. This also becomes a make work project, as the excavation work will be more extensive. Ideally, you want to place the wall where just the right amount of excavated soil will equal the amount of back fill material required behind the wall. Don't forget to include any back fill gravel you might have to purchase, as well as the excavated soil for the sub base. So this are just a few more thoughts on landscaping a slope. 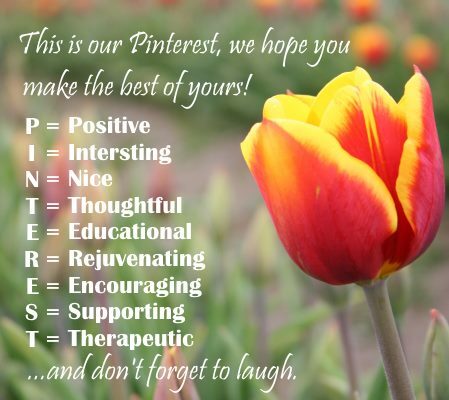 We hope this helps you with your project.